Starting from a mechanics point of view, the human (or humanoid) body is both a redundant system and an underactuated one. It is redundant because the number of degrees of freedom is much greater than the dimension of the tasks to be performed: around 640 muscles for humans and 30 motors for humanoid robots. It is underactuated because there is no direct actuator allowing the body to move from one place to another place: to do so human and humanoid robots should use their internal degrees of freedom and actuate all their limbs following a periodic process (named bipedal locomotion!). By considering first that motions are continuous functions from time to space (i.e. trajectories), and second that actions are compositions of motions, actions appear as sequences of trajectories. The images of the trajectories in spaces are named paths. Paths represent geometric traces left by the motions in spaces. The reasoning holds for the real space, the configuration and the control space. Therefore actions appear as continuous simple paths in high dimensional spaces. A simple path embodies the entire action. It integrates into a single data structure all the complexity of the action. The decomposition of the action into sub-actions (e.g., walk to, grasp, give) appears as the decomposition of the path into sub-paths. Each elementary sub-path is selected among an infinite number of possibilities within some sub-manifolds (e.g., grasp fast or slowly, grasp while bending the legs or not). – Motion Segmentation: what are the invariant sub-manifolds that define the structure of a given action? – Motion Generation: among all the solution paths within a given sub-manifold (i.e. among all the possibilities to solve a given sub-task) what is the underlying law that converges to the selection of a particular motion? 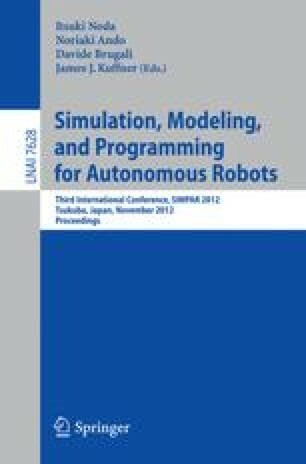 The talk overviews recent results obtained in this framework (including whole body manipulation, locomotion trajectory generation, action recognition) and illustrated from the HRP2-14 humanoid platform.